Kingdom of the Wicked by Helen Dale (Ligature Pty Limited) including Rules: Book One and Order: Book Two – The author, a legal scholar, creates a world inspired by comparative law, rather as Middle-Earth was inspired by comparative linguistics. In an alternative Roman Empire, an early scientific revolution and expanding free markets led to industrialization, the abolition of slavery, increasing wealth, and modernity – and to clashes with more traditional societies. In one such clash, a Jewish preacher, Yeshua ben Yusuf, is arrested and tried on charges of terrorism in a narrative that makes ingenious use of the Gospels to reach an unexpected outcome. State Tectonics, by Malka Older (TOR Books) – This story explores questions of governance and legitimacy in a future world shaped by technology-driven “infomocracy” and subdivided into centenals – separate micro-democracies, each an electoral district with a population of 100,000 or less. A multitude of political parties vie for control of each centenal, as well as global supermajority status in a problematic system where access to approved news is ensured by Information, which also oversees elections. In this third novel in Older’s Centenal Cycle, various parties struggle not only over election outcomes, but also whether Information’s monopoly will and should continue. The Murderbot Diaries, by Martha Wells (TOR Books) (including All Systems Red, Artificial Condition, Rogue Protocol, and Exit Strategy) – The tightly linked series of four fast-paced novellas charts the emergence of humanity, empathy, self-awareness and free will in an android, whose origins are partly biological and partly cybernetic. The android, who guiltily dubs themself “Murderbot” because of their past acts of violence while enslaved, fights for their independence but also is motivated to save lives by growing awareness of the value of human life and human rights in an interstellar future of social cooperation through free markets driven by contracts, insurance-bond penalties, and competing corporations. For more information, contact LFS Publicity Chair Chris Hibbert (publicity@lfs.org). Prometheus Award winner Ken MacLeod has posted a review and writes, “This effort to read with fresh eyes has paid off. On almost every page there’s a new insight or an arresting remark. 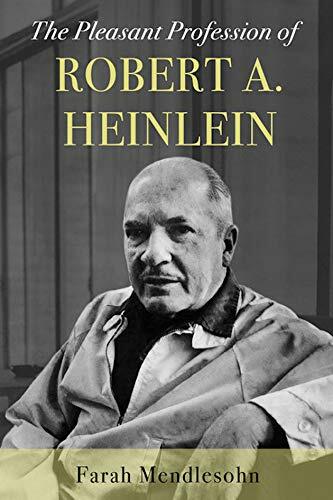 Mendlesohn takes Heinlein seriously as a thinker, and makes you think.” More here. Heinlein appears as a character in Gregory Benford’s new novel, Rewrite. “Is The Moon is a Harsh Mistress Heinlein’s All-Time Greatest Work?” By Alan Brown at Tor.com.